Fig. 1. Histograms (A) and dot plot (B) representing QuantiBRITE phycoerythrin (PE) beads. 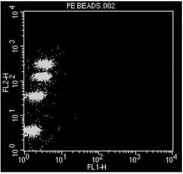 QuantiBRITE PE beads are a set of four beads with known levels of PE conjugated on them. 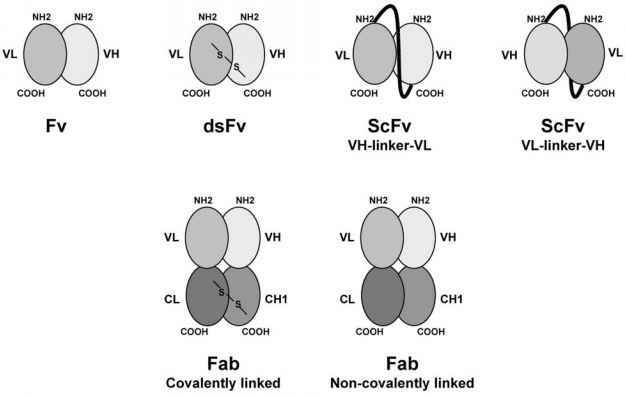 These are acquired in every experiment and used as a fluorescence standard to convert molecular equivalents of soluble fluorochrome to antibody-binding capacity. 1. Fix cells in 100 pL Intraprep reagent 1 for 15 min at room temperature in the dark, and then wash in the cell washer with flow PBS (see Note 3). 2. Vortex to ensure full resuspension of the cell pellet, then permeabilize cells with 100 pL Intraprep reagent 2 for 5 min at room temperature in the dark. 3. Incubate cells in the presence of 1 pg IgG isotype control or primary antibody (CRKL [32H4] or phospho-CRKL [Tyr 207]) for 15 min at room temperature in the dark. 4. Wash cells in the cell washer and resuspend them in 50 pL flow PBS. 5. Incubate the cells in the presence of 0.75 pg PE-conjugated secondary antibody for 15 min at room temperature in the dark. 6. Wash cells in the cell washer and resuspend in flow PBS for analysis (keep samples in the dark until ready to acquire). 1. 5000 events are acquired for every sample (see Note 4). Flow cytometry output is in the form of FCS files. 2. Analysis gates are placed around cellular populations of interest for the evaluation of the percentage of cells stained with antibodies relative to cells stained with isotype controls. An example of a result is shown in Fig. 2. 3. 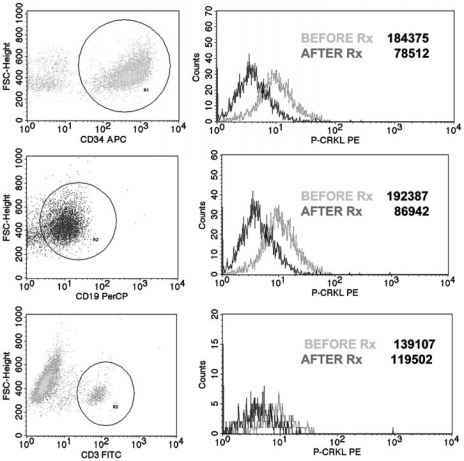 Flow cytometry output is converted in terms of ABC of CD3+, CD19+, or CD34+ cells using PE labeled with antibodies in a 1:1 ratio. 4. Though several data analysis programs are commercially available, we use FlowJO software. Fig. 2. Dot plots and histograms representing cells from a chronic myelogenous leukemia patient in lymphoid blast crisis before and after treatment with a tyrosine kinase inhibitor. Cells were fixed and stained with antibodies specific for phospho-CRKL at Tyr 207 residue (0.05 mg/50 p.L). The left column shows dot plots of a sample before treatment. The x- and y-axis correspond to CD surface marker and phospho-CRKL PE, respectively. Analysis gates (R1-3) were placed around CD34+, CD19+, and CD3+ cell populations. The right column shows histograms based on cellular populations delineated by analysis gates before and after treatment. In each histogram, the y-axis represents cell count while the x-axis represents phycoerythrin shift. Index values of cells are noted pre- and post-therapy. 5. For each sample, each cellular population generates the percentage positivity and ABC, which, when multiplied together, generate the index value (see Note 5).